If you're looking for an SUV that's bigger than a Honda CR-V but smaller than a Dodge Durango, the 2009 Kia Sorento might suit you perfectly. Its long list of standard equipment, low base price and comfortable ride make it a good choice for the casual off-road warrior or those who keep their driving strictly on the pavement. No major changes on the Kia Sorento for 2009. The 2009 Kia Sorento looks sharp and, on appearance alone, could easily be mistaken for a high-end Japanese SUV. The flared wheel arches, high windowsill line and wide side moldings impart a feeling of solidity, while the high ground clearance and optional Torque-On-Demand four-wheel-drive system promise good traction in slippery conditions. 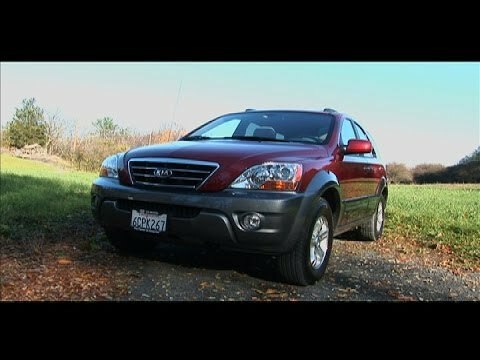 On the road, the 2009 Kia Sorento seems as solid and secure as the best SUVs from Japan and the U.S, and the steering feels light but precise and controlled. The Sorento's strong V6 engine offers plenty of low-end torque and highway performance. The five-speed automatic delivers crisp shifts and rarely has to hunt for the proper gear. The Sorento's somewhat soft suspension displays more front-end dive and rear squat than we would prefer during harder acceleration and braking. However, the handling in turns does not seem to be affected in the same way, and the Sorento delivers good cornering ability without excessive lean or body roll. The two-wheel-drive 2009 Kia Sorento LX Manufacturer's Suggested Retail Price (MSRP) starts close to $22,000, while the four-wheel-drive Sorento LX stickers closer to $25,500 and a fully loaded EX four-wheel drive tops out around $32,000. Before you buy, be sure to look at the Fair Purchase Price page, which shows the typical price paid for a Sorento in your area. Also click on the Incentives tab to see if you qualify for Kia's additional incentive and rebate programs. The Sorento is expected to hold about the same resale value as its closest competitors, at or just a few percentage points below the values projected for the Jeep Liberty, HUMMER H3, Ford Explorer and Nissan Xterra. The 2009 Kia Sorento LX trim level includes the 3.3-liter V6 engine, a five-speed automatic transmission, air conditioning, four-wheel anti-lock disc brakes (ABS), rear defroster, illuminated entry, remote keyless entry, auto-off headlamps, electronic stability and traction control, dual heated power mirrors, power windows, power locks, AM/FM stereo with MP3-compatible CD player and 10 speakers, front and rear side-curtain airbags, driver's knee airbag, fuel tank skid plate, cruise control, tilt steering wheel, four 12-volt outlets, alloy wheels and a rear wiper and washer. The EX with Luxury Package adds a 3.8-liter V6, fog lights, side cladding, power sunroof, eight-way power driver's seat, heated front seats, leather seating and interior trim, automatic headlamps, 16-inch machined alloy wheels, dual-zone automatic temperature control and Torque-on-Demand full-time four-wheel drive. Options for the EX include Torque-On-Demand full-time four-wheel drive, fog lights, remote start and a rear spoiler. The LX Value Package adds a sunroof, leather seats, 16-inch alloy wheels and a leather-wrapped steering wheel and shift knob. Stand-alone options and accessories include part-time four-wheel drive, a trailer hitch and side step bars. The Sorento's 3.8-liter V6 is a strong engine with good pulling and passing power, and it works particularly well with the five-speed automatic transmission. The 3.3-liter V6 in the LX reduces weight and cost, but delivers nearly as much power as the larger 3.8-liter. Those who need to tow up to 5,000 pounds, however, will want to opt for the larger engine, as the 3.3-liter is tow rated up to only 3,500 pounds. 2009 Kia Sorento. Start Up, Engine, and In Depth Tour. Kia review, likes and dislikes. Great warranty, but bad gas mileage for a smaller vehicle the only problems I have had are the mileage per gallon, as for comfort it is ok. Love the 4 wheel drive this vehicle has Easy to work on, nice leg room in both front and back seats. Tows my boat very easy, but it is only a 18 foot alum. Bass boat. Gas, comfort, room, and radio positioning. I feel like I have to refill my tank constantly. I also have replaced my headlights twice for I had to do it once on the other car. The car is very comfortable and is very roomy. I love a seat adjustment and how the radio is positioned. My next car I buy will probably be a Kia. My Kia love it because it is reliable. Love the way it drives and it has seats that heat up when it's cold the rear view mirror has a back up camera in it its 4 wheel drive good in snow can seat 7 people. Has remote starter in the keys. Seats in back go down so you have more room in the back for more to carry.